First things first, I finally am choosing to act on my New Years resolution to become more organized. Yesterday I cleaned the retail massacre that is my room and today I came up with a reasonable goal for the blog. I am a random blogger. I post randomly and it’s really confusing. From here on out, I will be posting every Tuesday and Friday. And now that this is posted all over the internet I have no choice but to carry through with this. Now back to part two of The Sweet Hereafter. The next section follows Billy Ansel, who lost his twins Mason and Jessica in the bus accident. Billy’s character is unique because as a reader, you want to shake sense and emotion into him, but you realize that his past makes this virtually impossible. Billy fought in the Vietnam War at the age of 19. He then married a woman named Lydia who died, leaving him with two young children. Billy finds himself out of focus sometimes. He recognizes a dire situation, but freezes, almost choosing to ignore it, until it goes away. He did this on a family trip to Jamaica. Stoned out of his mind, he accidentally left his daughter Jessica at a convenient store. He drove for miles after he realized that she wasn’t in the back seat and questioned how he could have forgotten her. When Mason said that they forgot her, Lydia woke up and Billy snapped back into reality. One could say that this behavior is from fighting in a dirty war at such a young age. Billy also escaped from reality after Lydia’s death when he had an affair with a woman named Risa, whose son Sean died in the accident as well. Billy hired a girl Nichole Burnell to watch over his children while he “grabbed some beers,” but really he met up with Risa at a local motel. His relationship Risa was just as escape from being a single parent. This behavior is changed when the accident happens because the town is covered in death. Billy cannot ignore it because Risa, his current escape, is suffering from the same loss and shock. Billy, for the first time, is forced to face reality: his children are dead, the town is destroyed, and life for himself and the community will never be the same. Is everyone totally depressed yet? Are you ready to eat comfort foods, rent the movie version of this book and cry? 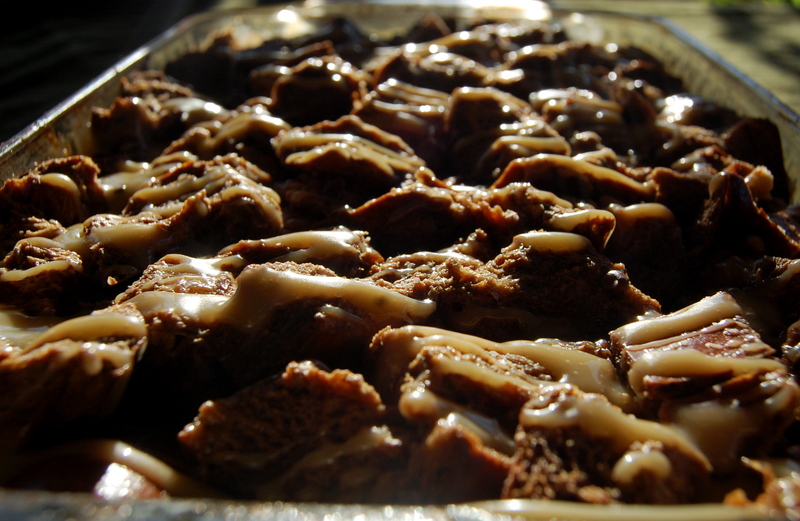 Well if you answered yes to this, I suggest you make this Salted Caramel Mocha Bread Pudding. It’s ooey, gooey, warm, salty, and chocolaty. 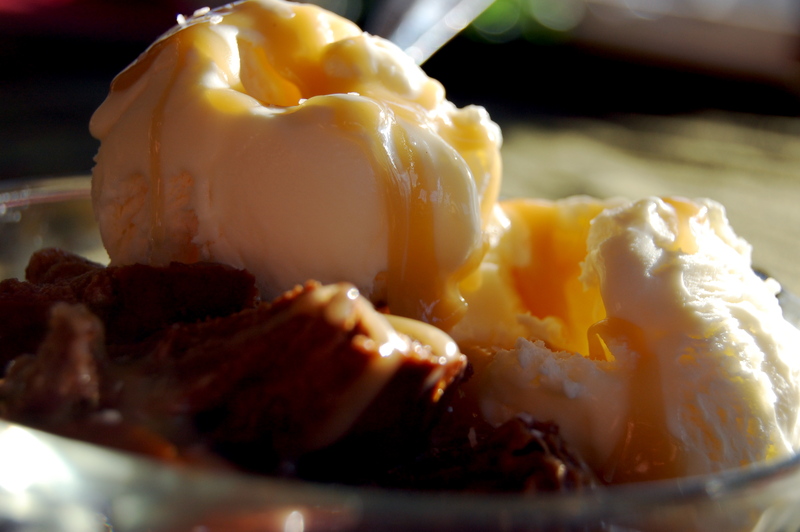 If you need extra comfort after reading this post, add a huge glob on vanilla ice cream on top. 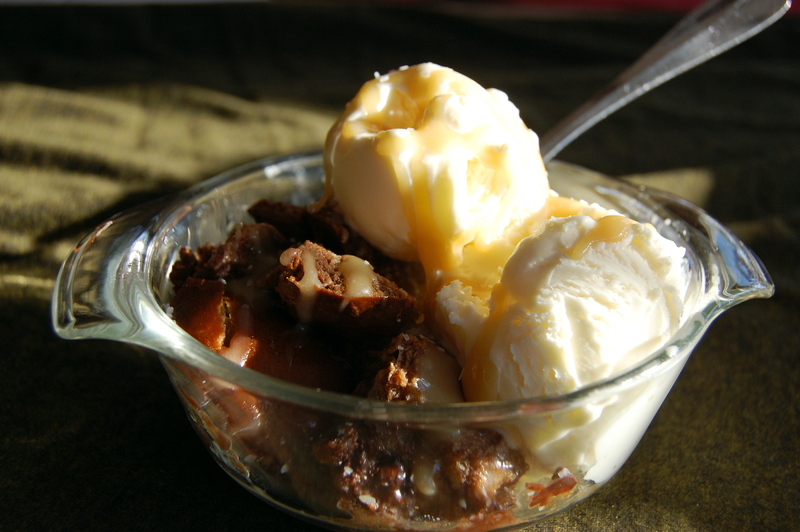 There’s nothing that goes better with warm bread pudding than an obnoxious scoop of ice cream. 3 Tablespoons light corn syrup. 1 Tablespoon coarse ground salt. 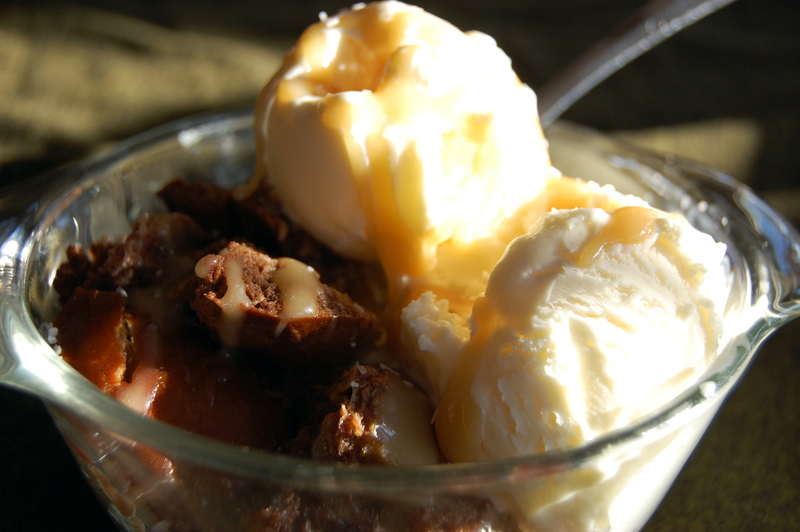 To make the caramel, melt together the butter, 1/2 cup brown sugar, sweetened condensed milk, and light corn syrup together in a saucepan. Cook on medium low, constantly stirring until the caramel begins to bubble. Set aside to cool. Chop the Challah bread into 1 inch cubes and set aside. In a large bowl, whisk together milk, cream, and liqueur. In another bowl, mix together the white sugar, brown sugar and cocoa powder until it is an even consistency. Then, add the sugar mixture to the milk mixture and whisk until even. Then, add the vanilla extract, cinnamon, and eggs into the mixture. Gradually stir in the grated chocolate. Grease a 13 x 9 inch baking dish and place the bread in the dish. Then, gradually pour the chocolate mixture over the bread. 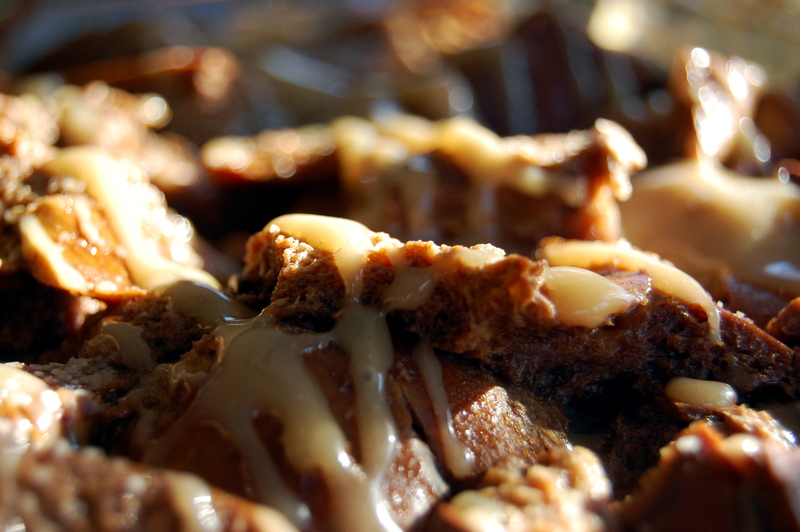 Take half of your caramel and using your clean hands, mix the caramel into the bread pudding. Let the bread soak in the liquids for 30 minutes. Then, bake your pudding for 60 minutes, or until the pudding sets. When a knife is inserted, it should come out clean. 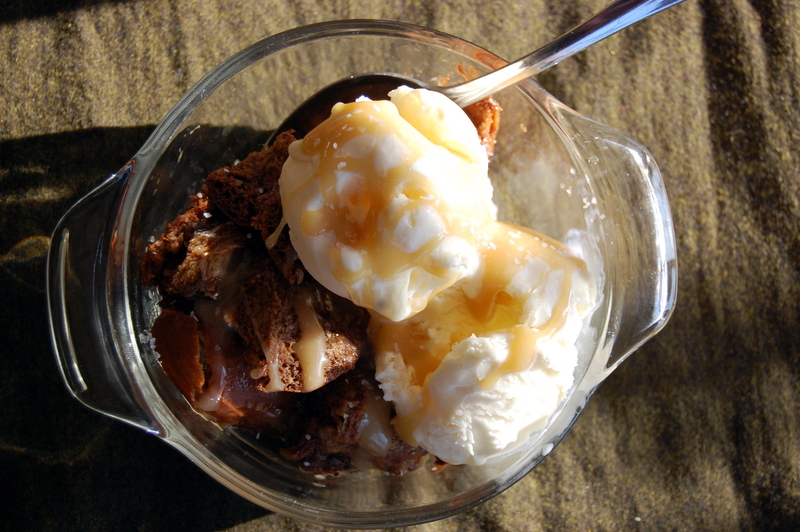 Top off by drizzling the remaining caramel sauce and sprinkling with salt over the top of the pudding. Add vanilla ice cream… you really should. Yummy , vanilla ice cream is really the only worthwhile flavor their is, makes the best things even better, thanks baker! !